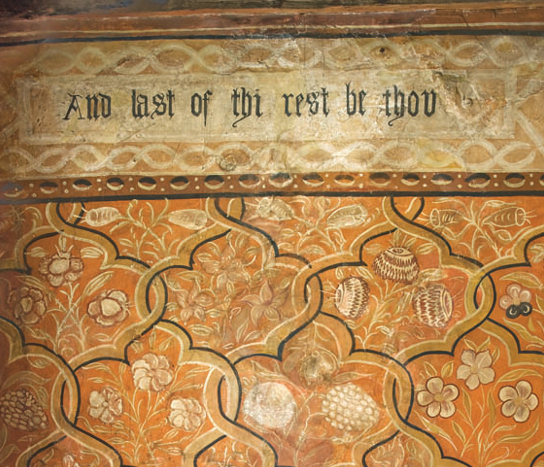 The wall paintings were discovered in 1927 by Mr. E. W Attwood when work was being carried out on a caretaker’s flat. Realising their importance he contacted the V&A Museum experts and most of the paintings were saved, protected behind panelling which was put on rollers. A back range of the building was demolished and the wall paintings removed to the Ashmolean, later placed on the wall in the Oxford Museum in the Town Hall (currently closed). In the 1930s OPT had our first offices here, including as the office to John Betjeman, who was secretary to the Trust in the 1940s. We left in he early 1970s to move to our saved buildings in St. Ebbe’s and over the years ownerships and tenants changed. The Rooms ended up in the possession of the City Council, all but lost from public view, their history and their conservation assets largely forgotten.